From the blue ribbons proudly adorning the judges’ picks at the bustling Indiana State Fair to the checkered flags jubilantly signaling the victory lap of another world-renowned Indy 500 Mile Race, winning is a time-honored tradition in Indiana’s capital city. Accordingly, when we set out to produce a cookbook representing our winning city, we determined that it must be of first place, blue ribbon quality. Our book, Winners, delineates the full variety of foods and techniques that blend deliciously to create our city’s distinctive culinary legacy. It stresses ease of preparation and use of only the freshest ingredients, and presents a spectrum of sophisticated recipes that lend themselves to elegant and memorable meals. Preceding inclusion, each recipe went through an exacting selection and triple-testing process. Only the very best of the 3,500 recipes submitted were accepted for final use. This collection includes hearty harvest favorites from the bounty of Hoosier farmlands along side prized ethnic specialties introduced by the many nationalities that have fused to form the cosmopolitan Indianapolis community. One additional notation is necessary. Indianapolis is and always has been a community known for the warmth of its hospitality – and the best of that hospitality is the wonderful food for Hoosier hostesses are deservedly famed. The success of the Winners cookbook’s first printing in 1985 declared it a winner – so much so that a second printing was called for in 2007. 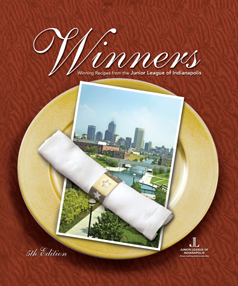 Once again we hope to share our traditions and heritage with you in a cookbook full of Indianapolis Winners.